Hartley and her boyfriend, Josh have been going out forever... so when rumors start flying that Josh is sleeping with Courtney Cline- the PRESIDENT of the CHASTITY CLUB, she ignores them... Until, it seems that EVERYONE knows about it and Hartley decides to do some investigating! "So I did what any good girlfriend would do. I broke into Josh's locker. Would the more mature thing have been to confront him directly with the rumor? Possibly. Would it have been as effective? I looked at the shiny gold-foil square in my hand. Doubtful."Dude!! Right? I know!! Hartley proceeds to text, call and all but send smoke signals to get ahold of her estranged boyfriend- with no response, she waits until after school to stalk him at Cross Country practice. Miraculously, he is not there... and Courtney Cline isn't practicing with the other members of the Color Guard on the other side of the field either. Interesting... "Sam, think I could borrow your brother's car?" "Probably," she paused. "Why?" "Because if I find Courtney Cline at Josh's and kill them both, I'm going to need a quick getaway." "Okay but we need to think of an convincing alibi on the way."Ha! Seriously, I could have written this entire review based solely on awesome quotes from Deadly Cool! Sam was so freaking awesome, I totally loved her!Hartley and Sam take off to Josh's house, only to have NO ONE answer the door. But, Josh's jeep is there and Hartley won't be deterred... She climbs through his freaking bedroom window. YES! Josh's bedroom is empty, but upon further inspection Hartley sees a sparkly purple shimmering coming from Josh's closet... the same shiny purple of Courtney's Color Guard uniform!She opens the door, FURIOUSLY demanding this boyfriend stealing, hypocrite to get up and explain herself! But Courtney doesn't get up and she never will again... because someone has strangled her with her iPod earbuds!OMG! Right?Of course Josh is still MIA, until he scares Hartley half to death by showing up in her room in the middle of the night- pleading his innocence as a murder! She decides he isn't a cold-blooded killer, but that he IS in fact a cheating a-hole and breaks up with him... all the while agreeing to help prove his innocence!Harley enlists the help of the epic-ly awesome Sam, and the uber hot, totally EMO, badboy Chase to aide her in this investigation.As the tangled web is wove... deeper and deeper into the story I fall. Chase is OH SO YUMMY, and after an 'anonymous' tip, a few leads and Hartley finds ANOTHER dead body on the football field, things aren't looking so hot! "Why did everyone think that stumbling on dead bodies was somehow my fault? Like I wanted to stumble on them. Like this was my idea of a good time. "Okay, really... This book was full of freaking amazing. 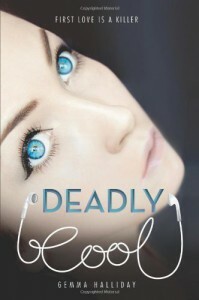 Seriously, I took Deadly Cool with me to the RACES (because my hubby insists on going FIVE freaking hours before the race even starts...) and I could NOT stop reading! 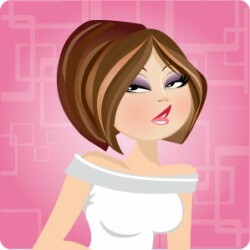 Hubby kept making fun of me the entire time, "People are looking at you! No one READS at the track babe!" Ha! Well, they aren't as awesome as I am- and they weren't reading Deadly Cool!Deadly Cool is a MUST READ of 2011! Hartley is amazingly awesome... There is romance, thrills, chills and mystery a plenty, you will NOT be disappointed!